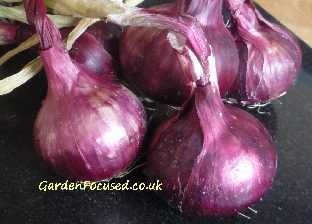 Onions are used in so many different meals that it would be a shame not to grow some in your garden or allotment. They store well, often to early spring next year so there is very little chance of growing too many onions. For the amateur gardener, onion sets provide the very best chance of growing healthy onions, much better than growing from seed. They require very little attention once established and as long as you practice crop rotation they are disease free. Onions and shallots are planted and grown in exactly the same way. Shallots are smaller versions of onions. Shallots grow in clumps, onions produce only one bulb. Shallots tend to have a milder flavour compared to onions. The disadvantage of shallots is that their smaller size makes peeling them a longer process. Many people think that onion sets are a relatively modern form of growing onions however our research shows that they have been cultivated for over a hundred years, see this article dated March 1911 as proof! An onion set is simply an onion which has not been allowed to grow to its full size. The growers of onion sets plant onion seeds very close together so the resulting onions grow very small because they are so crowded. For those who haven't grown onion sets or seeds before one question is often asked - how many onions grow from an onion set or seed? The answer is simple, one onion grows from an onion set or a seed. Many onion sets are "heat-treated" nowadays to stop them bolting into flower. The heat treatment involves storing the onions in very warm and sterile conditions for about four months. This effectively kills a specific part of the onion preventing them from bolting. 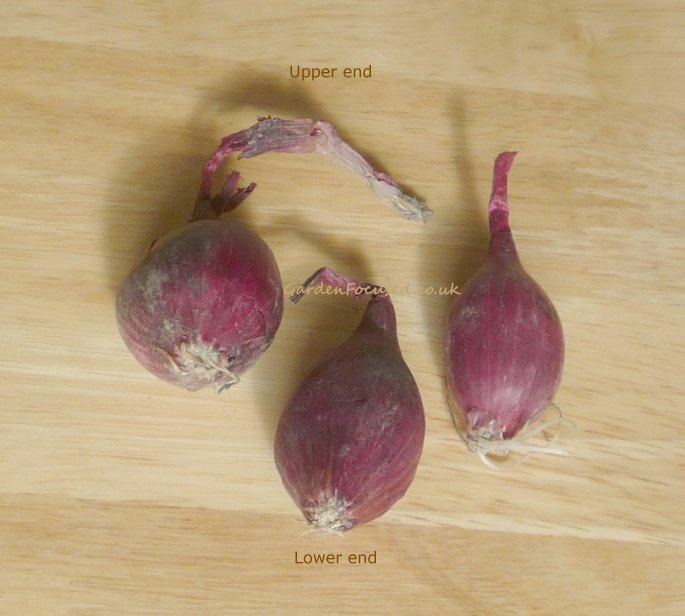 The key advantage which an onion set has over an onion seed comes from the fact that when you plant an onion set it is at a far more advanced stage of growth compared to an onion seed. They therefore spring into active growth much more reliably and quicker. The downside of onion sets is that they are more expensive compared to seed. In addition the number of varieties of onion sets is very small compared to the huge number of varieties which are available as seed. For more detailed instructions on how to plant and care for onions sets, see the paragraphs below. The calendar below is set for average UK weather conditions. All dates in this site will also be adjusted. Your setting will last for six months or more and will still be set when you revisit this site. Onion sets are normally available for sale from early March onwards. Combine this with the fact they start growing very quickly and you can see that there is almost no benefit to be gained by sowing them under cover. Also, most onions store very well so there is no real need to planting them staggered over a period of time. The best plan is to plant all your onion sets together at one time which is the second week of April 2017 (average for UK). If you do prefer to plant your onions sets under the protection of cloches then plant them two weeks earlier than the above date. Choose a day when the soil is not waterlogged. Onions are not particularly picky about soil conditions but they will prefer a well dug soil, preferably a few months earlier which drains well and is neither acidic nor alkaline. Having said that they grow well in most soil conditions. They also prefer a position in full sun or at least partial sun. Onions can very quickly become prone to disease if good crop rotation is not practiced so never grow them in ground where any member of the onion family (onions, spring onions, garlic, leeks) have been grown in last two to three years. Planting onion sets is simplicity itself. First mark out the row with a bamboo cane or string to keep the row in a straight line. Then every 10cm / 4in make a small hole in the soil with your finger and place an onion set into it. Plant rows about 30cm / 1foot apart, just enough to allow for hoeing weeds. It's important to plant them the correct way up with the root end onto the soil and tassel end uppermost. The picture on the right can be enlarged by clicking on it if you have any doubts. By making a little hole for each onion set rather than just forcing them into the ground you will avoid damaging the roots. Now gather some soil around the planted onion set so that just the top tassel appears above the soil surface. Gently firm the soil down. Scatter some long-lasting fertiliser (bonemeal or blood fish and bone) around the surrounding soil and work it into the soil surface wit a trowel. For the first few weeks birds may well be a problem for onion sets. 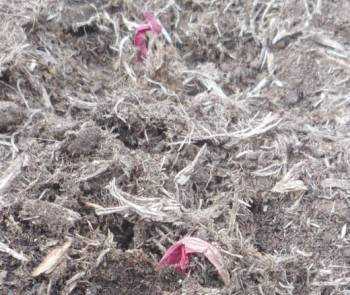 To avoid this spread some horticultural fleece over the soil surface and secure it down with soil or stones. The fleece can be removed after a month. If you want to grow larger onions, the solution is to start your sets off either indoors or in a greenhouse. Simply place the sets into modules filled with multi-purpose compost a few weeks earlier than normal. 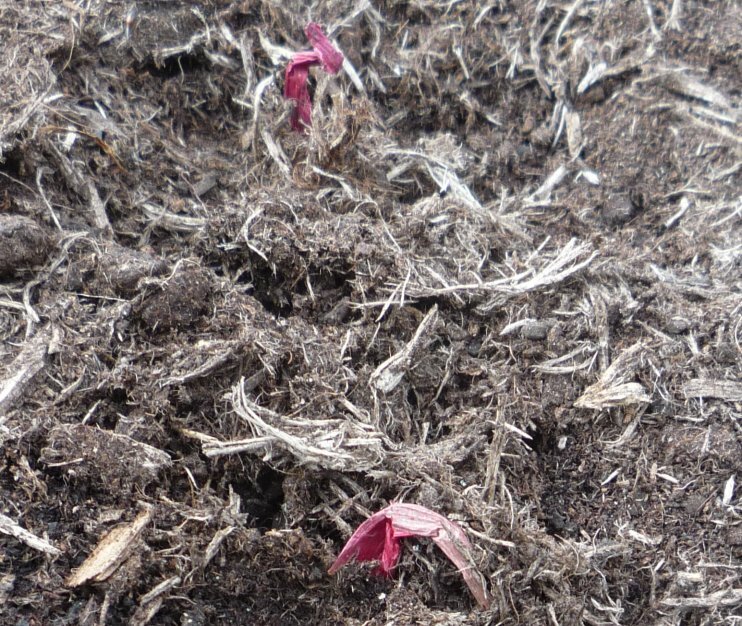 They will quickly develop roots and sprout shoots. Plant them outside at the same time as you would unsprouted onion sets. Onions are one of the easiest vegetables to grow and require very little attention. Their foliage is minimal so weeding will be required throughout the growing season. In dry weather they will need to be watered - lots of water occasionally rather than small amounts often is the best way to water onions and most other vegetables. If you have average soil then an initial feed at planting with blood, fish and bone fertiliser (see above) is all that your onions will need. Do not feed with any nitrogen rich fertiliser (especially from July onwards) which would encourage thick necks and the risk of Neck Rot. Around the third week of July stop watering your onions even if conditions become hot and dry. The reason behind this is to encourage them to ripen which will enable them to be stored for longer in the autumn and winter. If you have the time, gently tease away loose soil from the top of the onions with your fingers to allow the top and neck to receive as much sunshine as possible. Some varieties of onions are specially bred for planting in autumn and producing a crop in June. They are commonly known as autumn planted onion sets or Japanese onions. They can be grown in most parts of the UK. 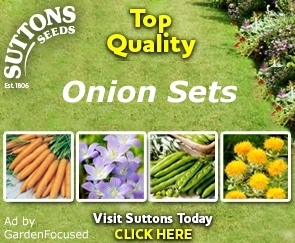 You should plant these onion sets in September up to mid October and they should produce fully grown onions in June. This will give you onions a month or two before your normal onions mature. For full information on the varieties to choose, how to plant and care for them and some tips on how grow them if you live in wetter areas, where they would normally rot, click here to go to our autumn planted onion page. Note that the dates for harvesting given in the calendar above are approximate ones only. Growing conditions throughout the spring and summer will greatly affect when your onions are ready for harvest. You need to look for yellowing foliage and stems which are beginning to fall over as the key indicators for ripe onions. It's also important to choose a period of dry and preferably sunny weather for two or three days so that the harvested onions can dry out in the sun which will greatly increase their storage life. Our own personal routine for harvesting onions is based on extending the harvest time for as long as possible. At the end of June (our area is about average for UK weather conditions) we begin to harvest onions individually for use in the next day or so. We choose the best developed ones, dig them up with a trowel and use immediately. Late July to early August we wait until a couple of sunny days are predicted and then dig up all the remaining onions. Do not bend the foliage over in attempt to make the onions dry quicker, this will only expose them to the risk of Neck Rot. Leave them on top of the soil to dry out for a couple of days. If the weather turns damp move the onions to a shed with lots of ventilation. Then we remove the loose soil and cut off some of the top foliage but not all. The onions are stored in a cool, dry place and used as and when needed. Onions are generally healthy vegetables but do sometimes suffer from pests and diseases and these can be very difficult to eradicate. Click here to visit our pages devoted to onion problems. Lots of clear pictures and expert advice. QUESTION: Can I grow onion sets in containers? ANSWER: It is possible but they key thing to bear in mind is that onions resent having their root system restricted. The container would need to be deep, I guess at least 45cm. They will not grow well at all in grow bags. COMMENT: If you take off any long tassels on your onion sets carefully without damaging the set and then plant them a little deeper in the ground so the tassels don't show the sets will grow perfectly well and you won't get any problems from the birds. QUESTION: Will onion sets Shakespeare perform well if planted in the spring? ANSWER: I have never tried it. However, the variety Shakespeare is marketed as an over-wintering onion and I guess it is probably not at it's best when planted in spring. QUESTION: I have received Sturon onions from supplier late Dec. What should l do with them until l can plant them in spring. Will they be OK in her bag in shed? ANSWER: They should be kept in a cool but frost-free place and in the dark. May sheds are frost free but only you will know for sure. Normally the suppliers provide onion sets in bags with small holes in them to ventilate the sets. This is the best container for them. ANSWER: When onion foliage is blown over there is nothing you can do about it. The foliage will still gather energy from the sun and the bulbs will benefit from that so leave them as they are until the leaves turn yellow. ANSWER: For almost all areas in the South East of England, the first week of April is when we would advise to plant onion sets. They have a good degree of light frost resistance so in most years that date will be fine. Enjoy your holiday! My local supplier only had red electric onion sets in stock this week, 27th January, which I bought (I usually buy red baron). Looked them up in the gardening book and found them to be autumn planting ones. 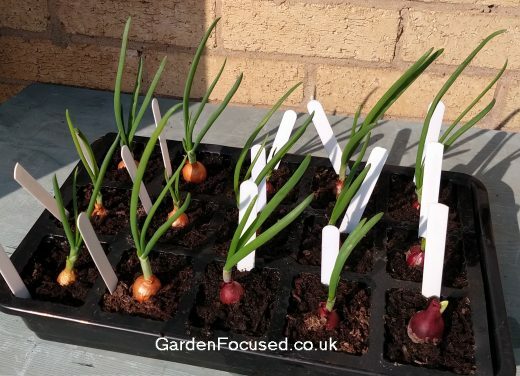 Will it be OK to plant autumn type onions in spring? They are very small and look similar to red baron. I don't think they would be sold if not suitable but just need re-assurance as I have always been very successful with red baron and have not heard of red electric before. Thank you. ANSWER: I think there are reasons not to plant autumn type onion sets in the spring but the subject is so complex that I don't apologise for not knowing the exact theory behind it! I believe it has to do with long, medium and short day onion types. If you wish to research this further, I'll point you to the article I wrote here on the subject. It was not intended to answer your specific question but does explain some of the principles. I have also found another article on the subject which can be found here. 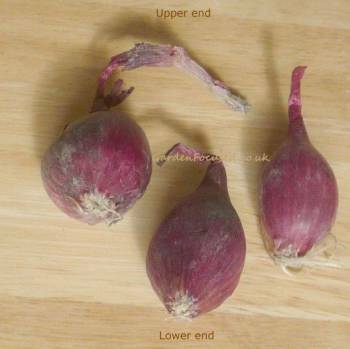 It is a long and very in-depth article but it may also help you to understand that not all onions are equal! Good luck. Thank you for your reply and following on from my question, will the onion sets keep for planting next year if kept in the right conditions please? ANSWER: I admire your determination not to waste those onion sets Tina! The true answer is no, they will not last over winter. But, understanding your determination, here is your best chance. Put them in a paper (not plastic) bag in the coolest part of your fridge. In early January take them out and if they are still in reasonable condition (unlikely but possible) plant them (half under the compost, half above) in pots of semi-moist multi-purpose compost. Place the pots in a cool, light position and see if they sprout at the top. If they do, write me again and I'll congratulate you and give more instructions on what to do next. You have my best hopes for success. I have some Stuttgarter onion sets left over from spring, can I plant them in Autumn? ANSWER: Stuttgarter are likely to rot if planted in autumn. Better varieties to choose for this purpose are Radar or Electric. I recently got 50 10x10" grow bags and I'm eager to grow stuff now. I have seeds for Ailsa Craig and Brunswick and also White Lisbon spring onions. So how many spring onions per bag and how many globe onions per bag do you recommend? My instinct is telling me 4 (or 5 if set them out like the dice face) of the globe veriaty, but as for the sping onions I'm really not so sure about. ANSWER: Onions like Ailsa Craig are planted 10cm / 4 in apart in raised beds so I reckon 5 in a 10in container. I do think though that growing them from seed at this time of year will not allow them enough time to mature. Spring onions should be about 4cm apart. Your website indicates that onion sets should be planted in the third week in April in the Northampton area. I have not been able to get onto my allotment early enough. I am doubly in trouble because I cannot get my onions in until the end of the week and it is the fourth/fifth week. I have just got my sets out of the garage and most of them are not firm. What are my chances of survival, please? ANSWER: I think if you plant by the end of the week they will still have time to mature. But as you say you have another problem in that the sets are not firm. Here's what I would do. Start to sets off indoors now. Get some egg boxes and fill the indents with moist compost. Place the onion sets (roots down) into each compartment of compost so that half the onion set is above compost level. Place them in a light and cool place and wait a couple of weeks. If the onion sets are going to grow they will have sprouted after a couple of weeks, if they are rotted they will simply rot further. By doing this you will give them a head start for little effort and quickly find out how viable they are. If it works, harden them off for a week and then plant in their final position. Good luck. How can I grow onion umbels from onion sets within 3-5 days? ANSWER: The simple answer is that you can't. Umbels are the seed heads which forms on onions at the end of the season. It would take several months for the seeds to form.